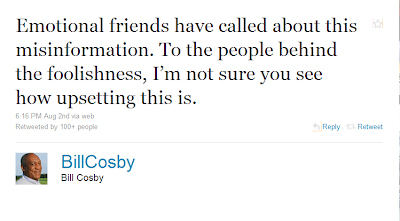 This Is Getting Old: Is Bill Cosby Dead? 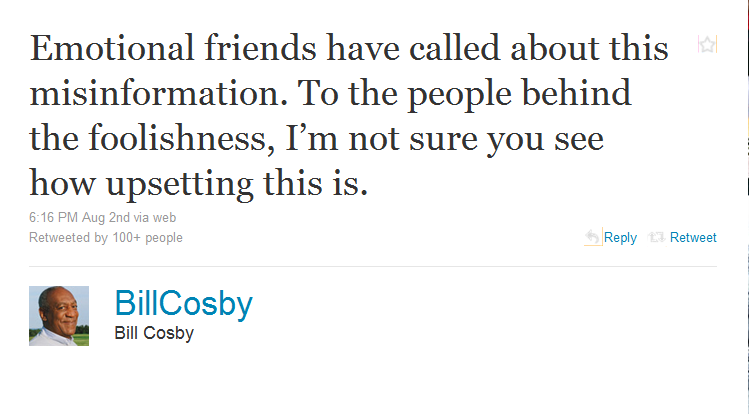 Bill Cosby is not dead and he doesn't like the rumors so stop it. We can't confirm if Sabrina Le Beauf is still alive. Hey Hey Hey. The line on this game dropped three full points, and for good reason. 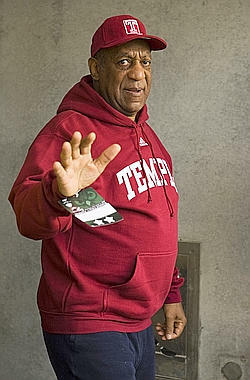 This Temple team is good, coming off an impressive win over UConn. Something about this game has me a bit worried. Penn State hasn't looked bad but could look much better, espically the Offense. Temple DE Adrian Robinson is a stud and could easily suit up for any big conference team. Keep an eye out for Bernard Pierce. The Owls tailback will give the Penn State defense fits all day. The last time Temple beat the Lions was in 1941. That's pre-Paterno. That won't happen today but this is going to be one hell of a football game.